My observing has been frustratingly limited this season. Working away from home (and the scope) with lots of driving plus the usual inclement weather are all conspiring against me. With a week off over Christmas and with no moon about, it was a pleasure to see that clear skies were forecast on Boxing Day (26 Dec). With my leave pass authorised, a quick call soon put a group of us together to visit our dark sky site on Salisbury Plain. Sociable observing is always such fun. It is nice to enjoy the camaraderie of a shared experience – plus I get to borrow Owen’s rather nice ethos eyepieces! I decided to take my 14″ tracking dob. Despite the bright views and benefits of goto and tracking, I don’t like travelling with this scope. The mount is so stupendously heavy, it has to be taken apart to load in and out of the car. As I had plenty of time to prepare during the day, I decided the benefits outweighed the hassle. As an aside, it would give me time to actually see the improvement after the Orion Optics’ recoating. It must be better than looking through a thin layer of crud that had built up on the primary after it had been stored upright for a few months when we moved house a few years ago. It was such a pleasure to be under the night sky, sharing the views, that I simply looked through the eyepieces as I worked my way across the sky. No need to make notes or sketches, set up laptops and stack images for processing later. Just me and ancient photons from across the galaxy and further into deep space. Of the usual highlights, the Orion Nebula, as always, is such a wonderful sight. I could spend hours studying the delicate nebulosity like folded lace sparkling with embedded diamonds. 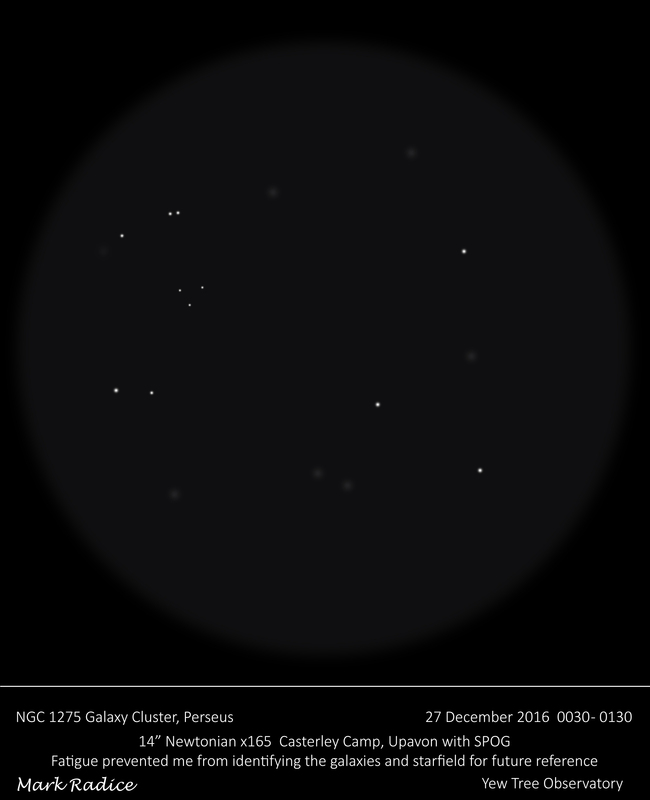 One particular object, however, was worthy of a sketch: a galaxy group centred around NGC1275 in Perseus, also known as Abell 426. The galaxy members were pretty dim, even away from the worst of the light pollution. A fairly rich star field also added to the mix so it was hard to differentiate faint stars from faint galaxies. I made a simple sketch as shown below that, if I hadn’t been so fatigued, I could have used to identify the brighter members in the field of view. I am not sure I got the best of it as my brain as the late hour had befuddled my brain. I will repeat this observation in the autumn when Perseus is once again high in the sky. So a delightful observing session and I am looking forward to having more once this contract is over.